is a biography for general readership. It introduces readers to the life of John Henry Newman, focusing on the development of his spiritual life and doctrine, and his conversion to the Catholic faith. The biography presents some of his many friends and the influence they had on each other. It includes three helpful maps, and some interesting photos. 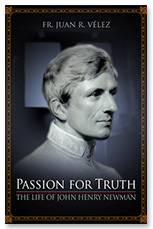 Passion for Truth, The Life of John Henry Newman, narrates Newman’s youth, education, friendships, and search for religious truth. The author, Fr. 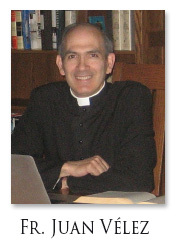 Juan R. Vélez, relates the events that led to Newman’s conversion, from Evangelical Protestantism through Anglicanism to Roman Catholicism. The biography, released by TAN/St. Benedict’s Press in March 2012, contains numerous passages from Newman’s letters, which convey his religious thoughts and theological arguments. Passion for Truth paints a picture of Newman’s intellectual honesty and courage in the pursuit of religious truth. Newman was guided by God’s revelation in S. Scripture, the teaching of the Church and the writings of the Church Fathers.